SOURCE: Signal changing, HDMI / AV1 / AV2. UP / DOWN: Choosing the menu. VOLUME: Volume adjusting when it has not entered in the menu; adjusting button when it enters in the menu. MENU: Enter in the menu. Power on, power light up, press SOURCE button and enter to HDMI / AV1 / AV2 signal. through the AV input interface, the sound could be heard. 3. HDMI input: Switch the screen into the corresponding HDMI, external HDMI device will connect with the goggles. 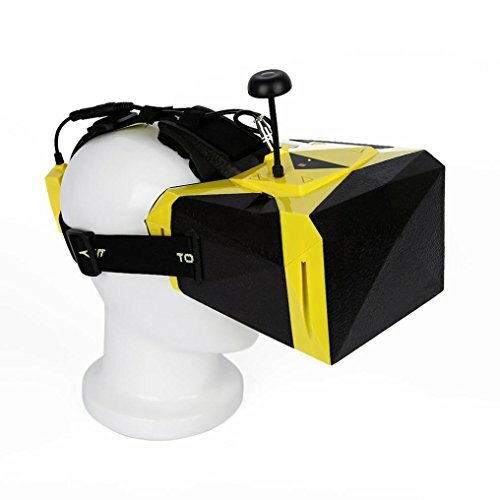 This TOVSTO VIVID FPV video glasses is the best partner of your multicopter! Its 5 inch and 72 degree angle screen makes the best feeling like movie theater. This new upgrade version brings the automatic frequency control system, just feel free to change it. Lightweight, it will not give your head a heavy feeling. View More In Flying Discs. If you have any questions about this product by Tiean, contact us by completing and submitting the form below. If you are looking for a specif part number, please include it with your message.